You've done all your research on how to safely transport you child in the car, and picked out a car seat—but there's a new tip that you should be aware of. Consumer Reports has a new bit of advice for parents: Move your baby to a rear-facing car seat by their first birthday, not once they reach the maximum weight listed on the seat itself, as was previously advised. The group crash-tested a 22-pound dummy, meant to represent a one-year-old baby, to examine the safety of infant seats vs. convertable seats. 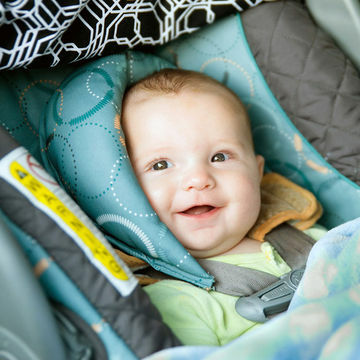 The results might surprise you: The infant's head hit the back of the front-seat in over half the tests—but in 24 of the 25 tests conducted with the convertible seats, that wasn't the case. A baby technically outgrows his infant carrier when his head is less than an inch from the top of the carrier's shell. This could explain the results of the crash test—that a bit of space between the shell and the infant's head is important to ensure the child's safety. In light of this, the consumer magazine advises parents to move their children to rear-facing seats when they're a year old and this piece of advice holds up even if they haven't outgrown their infant carriers. This rear-facing seat should be used until the child is at least two years old. After this point, it can converted to a forward-facing seat and used as such for a few more years. Consumer Reports evaluated each seat to determine its ease of use and safety - and while they reiterate that no car seat can fully protect a child from injury in the event of a crash unless its installed properly, a few front runners emerged. The Chicco Nextfit and the Britax Marathon ClickTight Seat got top parks, while the Evenflo SureRide and Cosco Scenera NEXT were named great budget buys. There's one other takeaway from this: You should always make sure your car seat is properly installed. Look for car seat checkup events at safekids.org.